Description: Professsional stock analysis/screening software for Free or only $12/month. Supported analysis include: Trend Breaking, Chart Patterns, Gartley 222, Candlestick Patterns, Technical Systems using Indicators, Fundamental Analysis. Features include Free data update, MetaStock data support, Fast and beautiful charts, Visual Backtesting, and Portfolio Manager. Fully customizable plugins, User-Friendly trading system development. Description: Countries like Afghanistan, Syria, and Iran have already suffered enough from human instigated wars, it's time to halt the misery and sufferings of the people living there. International military troops deployed in these war-torn countries are in a continuous fight with the rebel groups.17 years have passed since the United States began the war on terrorism in Afghanistan, still, they aren't rooted out completely. Description: The free software Best-Charts offers real-time prices and historical prices of 45 countries?s stock and displays the smart charts of world stocks and Forex. The buy and sell signals are shown on the charts. The function of the back-testing can calculate the performances of each indicator. The software can optimize the parameters of the indicators for the maximum profit. Description: The free software BlockChain1 offers free real-time prices and OHLCV historical prices of 100+ cryptocurrencies. It supplies 150 top built-in indicators. The BlockChain1 team developed the Smart Trading System. Users may easily develop new indicators in this software. The software can show intraday, daily and weekly charts of 100+ cryptocurrencies. The software can optimize the parameters of the indicators and give best buy and sell signals. Description: This online course shows you how to build a long term sector fund rotation model using Microsoft Excel. Microsoft's Visual Basic (VBA) language is used with Excel's user interface, formulas, and calculation capabilities to deliver a powerful and flexible investment tool. The Model is based on the classic market economist's Sector Rotation Model, providing several crucial improvements that eliminate the guesswork in timing fund switches. Description: This online course shows you how to build a sophisticated automated stock trading model using Microsoft Excel. Microsoft's Visual Basic (VBA) language is used in conjunction with Excel's user interface, formulas, and calculation capabilities to deliver a powerful and flexible trading tool. The Model includes five proven technical indicators (ADX, moving average crossovers, stochastics, Bollinger bands, and DMI). Description: CandleScanner is a technical analysis software package created for investors interested in Japanese candle patterns. What makes this application exceptional is that it has been specifically designed for the detection of Japanese candle patterns. It is suitable for both seasoned traders and complete beginners. Description: Coin Balance Tracker is a freeware that will help you view the current balance history of any bitcoin BSV/BTC/BCH address. You need only a internet connection and a valid coin address string. This is a safe service because it uses only public data, there is no need for login and password. 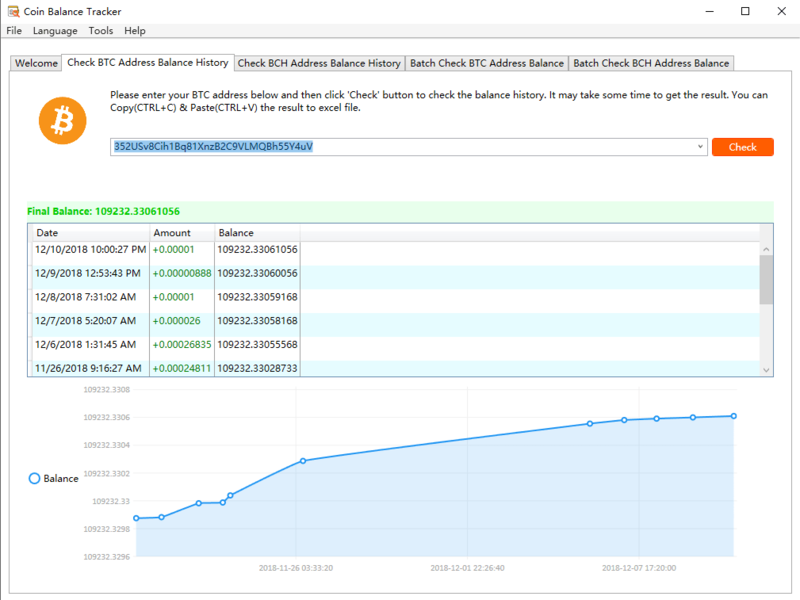 Description: Coin Balance Checker that help you view the current balance history of any bitcoin BSV/BTC/BCH address.